Back at the turn of the century, the 2000/2001 Oakland A’s were remarkably successful, and that success led Michael Lewis to write a little book called Moneyball, which you’ve probably heard of. I think everything that could possibly be said about that book and those teams has probably been said, written, and re-hashed 100 times, so don’t worry, I’m not writing this post to kick that dead horse anymore. I just want to point out that, 12 years later, the A’s have basically done the exact same thing that got the book written in the first place. Those A’s teams won 193 out of the 323 games they played, the second best winning percentage in the game, despite the fact that they were spending a fraction of what their high revenue competitors were throwing at players. The A’s teams of last year and this year have won 182 of the 312 games they’ve played, the second best winning percentage in the game, despite the fact that they were spending a fraction of what their high revenue competitors were throwing at players. For more context, a table. Payroll % is simply the amount of total league payroll that the A’s accounted for in those two year windows. Basically, once you account for the inflation that the game has seen as a whole, the A’s aren’t really spending more now relative to their opponents than they were 12 years ago, even though their payroll is $20 million higher now. While MLB is certainly doing well financially as a sport, the A’s continue to significantly trail their counterparts in both revenue and payroll. And yet, they keep winning. Since the start of last season, the A’s are 29th in MLB payroll — only the Astros have spent less — and 2nd in wins, only one victory behind the Braves for the title of winningest team in baseball. The Braves themselves deserve a lot of credit for building an excellent team with an average payroll, but even they have outspent the A’s by nearly $60 million over the last few years. For all the well earned congratulations the Rays have gotten for winning on a budget, they’ve spent more money on big league payroll and have 10 fewer wins than the A’s since the start of last season. There is no team in baseball doing more with less than the current version of the A’s. There isn’t even a team that is all that close. With their recent surge and the Rangers collapse — coming in part due to the A’s just beating them head to head over the weekend — Oakland has all but guaranteed themselves a second straight division title; even the A’s teams that got Moneyball written didn’t accomplish that feat. And this has all happened during the era in which the A’s advantages were supposed to have dried up. Every team — okay, almost every team — is now putting value on guys who can get on base and avoid making outs. The big market, high revenue teams have adopted many of the A’s philosophies, and are now using an analytical approach to building a team, rather than squandering their advantage in resources as was more common a decade ago. Pretty much every team has someone or multiple someones in their front office doing work with databases and looking for market inefficiencies. The A’s aren’t a revolutionary in terms of decision making anymore. But they’re still really good at finding value. I wrote about some of their successes back in June, highlighting the huge returns the A’s have gotten from guys like Josh Donaldson, Coco Crisp, and Bartolo Colon, who make about $12 million between them this season. And certainly, those three have been hugely valuable, especially Donaldson this season. However, these A’s teams aren’t winning the same way that the Moneyball A’s teams did. One of the loudest criticisms of the book, and the theories it espoused, is that Beane and his staff were just riding the coattails of a few really great players, most notably The Big Three of Mark Mulder, Tim Hudson, and Barry Zito, with a side of Miguel Tejada, Eric Chavez, and Jason Giambi thrown in for good measure. This team, though, is winning because of the strength of the bottom of the roster, not the top of it. 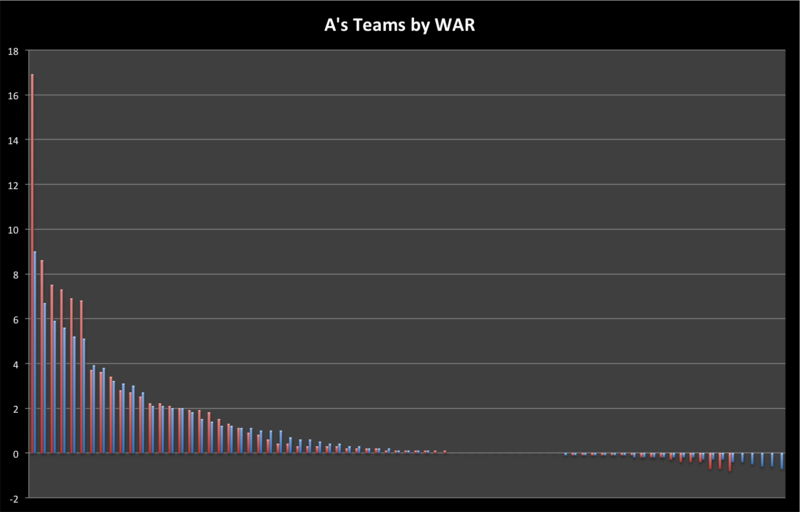 Here’s a graph of the distribution of WAR for every player who contributed to either the 2000-2001 A’s teams or the 2012-2013 A’s teams. The Moneyball era A’s players are in red, while the current players are in blue. Those 2000-2001 A’s were extremely top heavy, with the top six players combining for +54 of the team’s +92 total WAR during those two seasons. By contrast, the top six players on the A’s teams of the last two years have racked up +38 WAR, accounting for about half of the team’s total production, but well less than the 60% that the Big Three hitters and pitchers were responsible for back then. The difference has been almost entirely made up in roster spots 7-25, which are regularly overlooked places to add value. After the huge dominance of the red lines (the first one is Giambi, if you’re curious) in the first six spots on the chart, you see the blue lines begin to take over almost entirely after that. These A’s teams are bottom heavy, as they’ve gotten production from nearly every spot on the roster, rather than having a small core of stars do the bulk of the heavy lifting. And this, more than anything, seems to be the best way to find value in the marketplace today. This is essentially the same plan that the Red Sox have used to resurrect their team after last year’s implosion, dumping a few premium players (by reputation, at least) and replacing them with a larger quantity of less heralded but still productive players. With the rest of baseball catching up on things like on base percentage, the A’s have once again led the charge towards building winning rosters on the cheap by exploring roster construction methods not currently en vogue. People still like stars, but Donaldson — the A’s most productive player during the past two seasons — ranks 27th in the majors in WAR during that time. The A’s best player wouldn’t have been the best player on nearly any other team in the sport, and yet, they are second in the big leagues in winning percentage during that span. Stars are great, and there’s nothing wrong with having great players, but baseball teams do not win because their stars performed extraordinary feats, as the Angels can certainly attest. There’s no single right way to build a baseball team, but there are some ways that are cheaper than others. The A’s lack of resources means that they constantly have to be looking for the cheapest ways to win. 12 years ago, that was developing home grown stars and finding unathletic looking guys who got on base. Now, that’s building a deep roster of above average players and utilizing them as well as possible through the effective use of job shares and platoons. The Moneyball A’s won in large part because their strengths were very strong, but these A’s are winning because their weaknesses are not very weak. Given how the game has changed, how everyone else in baseball is now trying to do the same thing, and how the spread of knowledge across the sport was supposed to close the loophole that allowed Beane and his staff to build a winner in the first place, this team is probably more deserving of having Lewis write a book about “the art of winning an unfair game”. That the A’s have done it again is truly amazing. We hoped you liked reading The A’s are Moneyballing Again by Dave Cameron! Love the article, but your analysis of Donaldson is a bit off base considering he wasn’t even called up until the last month or so of the 2012 season. So when you say, “People like still stars, but Donaldson — the A’s most productive player during the past two seasons — ranks 27th in the majors in WAR during that time. The A’s best player wouldn’t have been the best player on nearly any other team in the sport” about the guy who is basically tied for second best player in the AL this season, that’s a little misleading. Was going to post the same thing, with a couple minor corrections. Donaldson actually had 98 thoroughly-uninspired MLB PAs in the first half of 2012. Then he went back down to AAA, gave up catching, and — coincidentally or not — hasn’t stopped hitting since. Make that 100 PAs in the first half of 2012, with 98 ABs. Which ought to make his current 2013 walk rate of 11.1% all the more impressive. One more minor correction. Donaldson had already stopped catching during his first stint last season. The A’s gave Donaldson the third base job after Sizemore tore his ACL the first day of spring training. You’re right that Donaldson played pretty much exclusively at 3B in 2012. But, for the record, Donaldson did start three games at catcher for the A’s in 2012 — on June 3rd, 10th, and 13th. That game on the 13th on was his last in the bigs until he got called back up in August.